This year’s Law Day theme is “Free Speech, Free Press, Free Society.” The theme focuses on these three fundamental rights and calls upon us to understand and fight to protect them. In the United States and abroad, free society is built through free speech and free press. These topics often become the center of conversation and the focus of litigation. It is hard to imagine a free society without these individual liberties, but historical and current debates surrounding them continually challenge us to consider their boundaries and resilience. Technology is ever changing and shaping and shifting how free speech and free press work in the everyday world. For the other Law Day information, check out the OBA Law Day webpages. You Mean the Government Can Control My Guns? Illegal firearm transfers have potentially severe consequences to both the transferor and the transferee. Estate planning and probate attorneys need to be aware of these potential traps and inform their clients that fines of up to $10,000 and jail time of up to 10 years (or both) can be imposed for improper transfers of certain firearms.1 Additionally, establishing estate planning tools to protect the parties involved in the transfer will assist in complying with federal and state law, helping to protect fiduciaries and beneficiaries. On Tuesday evening, March 5, the top two high school mock trial teams met for the final round of competition to determine the state winner. For the second consecutive year, the final teams were from the same high school. The 2019 Oklahoma High School Mock Trial Program final round was won by Owasso Team Quadstone after defeating Owasso Team Heisenberg. The Quadstone team will now represent the state of Oklahoma at the National High School Mock Trial Championship in Athens, Georgia, this May. 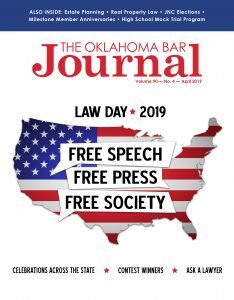 The Oklahoma Bar Association congratulates these members who reach significant milestone anniversaries in 2019.